Matt graduated from the University of New England in Portland, Maine with his Doctorate of Physical Therapy. While in school he worked in multiple settings including outpatient orthopedic, inpatient acute and psych, and one clinical rotation at the Quantico Marine base in Virginia. His passion for helping others has brought him as far as Ghana in West Africa to participate in a two week cross cultural health initiative. 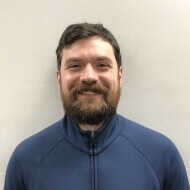 Matt enjoys working with a wide array of sports and orthopedic injuries and conditions, and utilizes a balance of manual therapy, therapeutic exercises, patient education, and modalities. Prior to studying and practicing Physical Therapy, Matt studied English literature at Tufts University. In his free time he enjoys reading, traveling, and staying active with running, hiking, etc.